The Lowepro Lens Case 4S is ideal - providing excellent protection for lenses such as these. With additional padding (over the smaller Lowepro Lens Cases) and a rigid base, the Lens Case 4S will protect your investment in shorter and wider lenses. Water-resistant 600D TXP™ outer fabric provides protection from wear. The Lowepro Lens Case 4S includes a SlipLock attachment - attach it to your SlipLock base product such as a camera bag or Lowepro Belt. 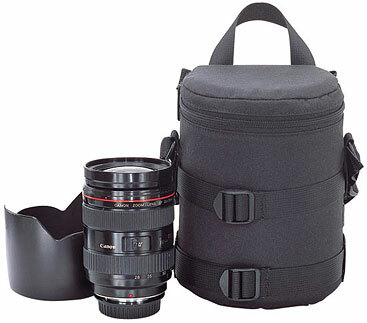 You can carry the Lens Case 4S on the included shoulder strap. The 4S also includes compression straps for attaching to other Lowepro packs and bags. The interior size of the Lowepro Lens Case 4S is approximately 4.25"D x 6"H (11 x 15 cm) . Everyone has their own preference for carrying their lenses and gear around. My personal decision has been to individually protect each lens in Lowepro Lens Cases. My lenses represent a significant investment to me - I take excellent care of them. Acquiring the appropriate lens case for most of my lenses is the standard of storage protection I follow. The lens case investment is small - the protection is very good. Lowepro Lens Cases are basically thick, slightly-rigid padded nylon pouches with a protective OverLap Zipper(tm) that goes most of the way around the top of the case. When traveling by vehicle, I often place filled lens cases in a Pelican Case or even a strong Rubbermaid-type plastic storage box. They are well protected from impact and moisture - and the plastic storage container not a target for theft. When I am carrying the lenses for possible use, I will typically SlipLock a Lowepro Lens Case or two to a Lowepro Toploader case (such as the Lowepro Toploader 75 AW) or a Lowepro Light Belt. This makes for a highly customizable setup. You can adjust your cases to take exactly what you need for the shoot. Lowepro's SlipLock attachment is a series of flexible and semi-rigid nylon and Velcro tabs. The semi-rigid tab on the Lowepro Lens Case slides through a wide nylon web on a larger case or belt and Velcros back onto the Lowepro Lens Cases. An additional flexible nylon strap Velcros onto the back of the semi-rigid tab locking everything in place.